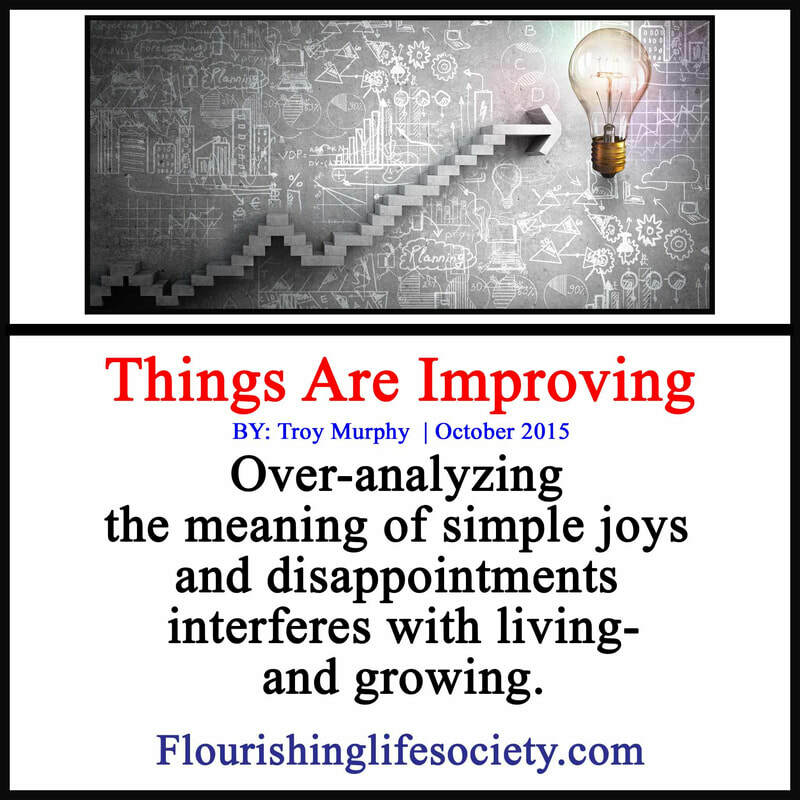 Over-analyzing the meaning of simple joys and disappointments interferes with living--and growing. “Things are getting better,” we tell ourselves, stringing a few good days together. Occasionally agitations settle—at least temporarily, and we feel peace. But does this peace represent long-term change? Change often occurs with imperceptible improvements, a few happy moments may be the dawn of a new day—or just a few isolated happy moments. We can read too much into normal ebb and flows of feelings. Perhaps, we should just enjoy the good days when they come as a blessing, without agonizing over the deeper meaning they imply about days not yet arrived. By expecting pleasant experiences to inaugurate the arrival of a desired paradise or each setback as a sign of impending disaster, we overlook the normal ups and downs, giving each experience more importance than it deserves. By dumping too much expectation on an experience, even the enjoyments eventually disappoint, and minor setbacks burden us with undue stress. This over-analyzing of the moment to determine it impact on the future destroys the liveliness of experience. Our side commentary, judging a break in the storm as permanent, squashes the joy, and quickly is followed by disappointment when the rains begin to fall again. The momentary respite quickly dissolves and the normal humdrum resumes, reminding that things aren’t improving, or not improving fast enough. Like the stock market, a few losses don’t indicate a long-term direction. Life is complex full of good and bad days. We must broaden our view, accepting the momentary frustrations, and enjoy the passing pleasures. By panicking over disappointments, sadness, or frustrations, we disconnect from the moment, being swallowed by thoughts and agonizing over normal setbacks. Measuring progress is difficult. Growth occurs over months, years and decades—not moments. The minute changes that subtly transform our lives are not observable from the close inspection at a single point in time. The changes are obscured by the smallness, and ordinary setbacks. Consistent small movements in the right direction, while not magically transforming, play out over time. We move forward, slowly adapting to the new circumstances. We can’t see improvement until we step back and view our lives against the backdrop of years and decades, only then seeing great progress. When watching a flower bloom without the aid of time lapsed photography we never see movement—but movement is occurring. If we return in a few days, we see a beautiful flower where a closed bud once existed. "Consistent small movements in the right direction, while not magically transforming, play out over time. We move forward, slowly adapting to the new circumstances." Constant evaluation discourages our efforts, we fail to recognize growth or decay in the moment to moments snapshots. We need to refocus attention to action. We work to do the right things today. Constructive behaviors create change; but only over time. Things improve in their own time and in their own way. While momentary setbacks disrupt and hurt, they don’t necessarily destroy progress. A few happy days don’t signal success or failure. We just keep doing the right things and take the good day and bad days as they come, enjoying the pleasures and working through the sorrows. We must maintain faith in proven methods, whether momentary gains or losses immediately reflect the consequences we seek. Keep going. Keep gathering wisdom from reputable sources. Surround yourselves with helpful others. And when you begin to grey, and you look back over the contents of your life, you see the beauty of a life well lived. You then know that all along, the adventures of joy and sorrow, both the mountains and the valleys, your life was improving, becoming an example for your heritage, and a standard for all.